Born and educated in Sydney Australia, Gabrielle has over 35 years experience in the hospitality industry, always with a total dedication to producing and presenting beautiful, healthy food. Having already successfully managed restaurants, boardrooms of major corporations and large public catering events, Gabrielle became involved in managing premier catering operations focused mainly on Sydney’s Eastern Suburbs and North Shore. Her ‘hands on’ approach and passion for haute cuisine – together with an enviable reputation for unfailingly high standards of food safety, presentation, and excellence in service – soon led to her being constantly sought after as caterer of choice by a large number of prominent Sydney residents, many of whom fondly refer to her as ‘The Souffle Queen’ . Through word of mouth Gabrielle also found herself in demand by visiting high-profile international celebrities from film, politics, music, theater, finance, and famous names from the international horse breeding/racing fraternity. Notwithstanding this, Gabrielle became inclined toward an altogether new and exciting challenge that utilized her extensive experience and so accepted an AusAID funded teaching position (see picture above) located on the beautiful coral fringed tropical island of Vanuatu. 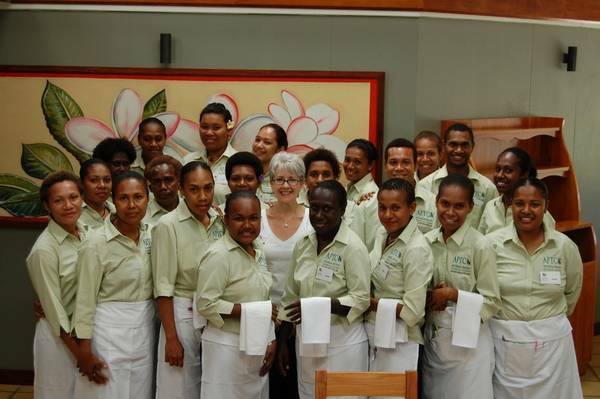 This AusAID teaching role was specifically targeted at making a major improvement in food preparation techniques, styling, and above all, hygienic market-to-table food safety standards for the long term benefit of the tourist industry in the South Pacific. Her keen and enthusiastic students were selected as representatives from the many different islands of this vast area. According to cards, letters and emails Gabrielle has received, students went back home happy and eager to not only apply their new skills themselves, but determined to teach others around them what they had learned – especially about critical food safety procedures. No doubt much improved outcomes for tourists! Upon returning to the Australian mainland after her teaching role in Vanuatu, Gabrielle became determined to make a meaningful contribution to the improvement of food safety standards at home in Australia. This strong resolve was further reinforced by increasing media reports on poor food handling practices resulting in over 5 million confirmed cases of food poisonings that year! It was at this time that Gabrielle focused her efforts on the Aged Care industry. Residents living in aged care facilities are considered vulnerable persons by the NSW Food Authority and require ‘state of the art’ food handling practices to ensure that the food they are served is safe to eat. Gabrielle has already assisted numerous aged care facilities in this regard and has been pleased to see those who followed her ‘GT Program‘ achieve and maintain the highest possible standards in food safety, thereby gaining the prestigious ‘A’ rating from the NSW Food Authority. Owners of various other food manufacturing and preparation businesses have also gained from her ‘GT Program’ as their staff have enjoyed the fun and effective training methods Gabrielle has developed over the years. They also invariably express much appreciation for her personal assistance in ‘coming to grips’ with the technicalities, formalities, and detailed documentation involved in complying with today’s regulatory Food Safety Standards. Upskilling staff in Food Safety is vitally important in todays media driven marketplace where the creation of competitive advantage and the maintainance and protection of the invaluable asset known as ‘Brand Reputation’ is paramount. Need help in getting your food safety on track? or email a brief outline of same to….